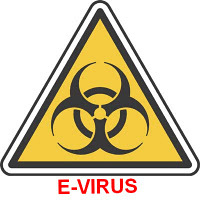 IT-manager's Life (English): E-Virus (Part III): I have a PC infected! Now as I clean it? ... you should read up as much as possible about the characteristics of those viruses that are present (mode of distribution, payload, removal instructions). If you know your enemy it's easier to defeat him! In fact, if you know the name of the virus and how it is dangerous, it is possible to find a specific removal tool freely available from software companies like: Symantec, Kaspersky, McAfee, TrendMicro, etc..
For example, there are removal tools for the most common viruses such as: Melissa , Bagle , MyDoom, Sasser , Conficker, Zeus, etc..
Obviously you can increase the benefits of these products by performing sequentially scanning of the PC by the use of different tools. Sometimes however, you might need to do multiple scans with different products but you can not install too many anti-virus simultaneously on the same PC due to speed and compatibility issues. Besides, the sequential installation and removal of different antivirus is a costly and long process, but you can avoid this using free online tools for virus scan and removal offered by some software companies (the only constraint is need to be online to scan). Of course, all these operations are feasible if the virus has not completely compromised the access to your PC. If you can't start the operating system then you can use antivirus software from a CD or bootable USB key (Rescue CD). These systems are typically available as .ISO images and you must create a CD / DVD or install it on bootable USB sticks, so you can operate apart from the operating system (Windows / Linux) that is installed on the infected PC . You have only to carefully verify that the BIOS first boot device is selected to the CD or USB external drive. Once you start the CD you can scan the hard drive and require the deletion / correction of the infected files. I have often used some of these tools along with excellent results. In particular ComboFix has been decisive with the most "insidious" viruses. Regarding the now infamous "worm" Conficker - Downadup, I can indicate the presence of specific free removal tools from almost all antivirus manufacturers. Among these however Bitdefender provides also a free removal tool that works on the whole LAN and not only on the individual PC ( Network Downadup Removal Tool ). Sometimes even after the virus removal, the operating system is "unstable" because it is partly damaged by the virus itself. In these cases a viable technique, apart from the total re-installation of the O.S., is to go back the System Restore a few days before the virus infection (feature available from Windows XP ).